When Carl Sagan suggested that the Voyager spacecraft turn towards Earth and snap one last picture of our planet as it exited our solar system, he knew exactly what he was doing. The photograph that returned sparked an entirely new cosmic perspective of ourselves. In this image our planet is barely a pixel in size, alone in a vast sea of nothing... "a mote of dust, suspended in a sunbeam." 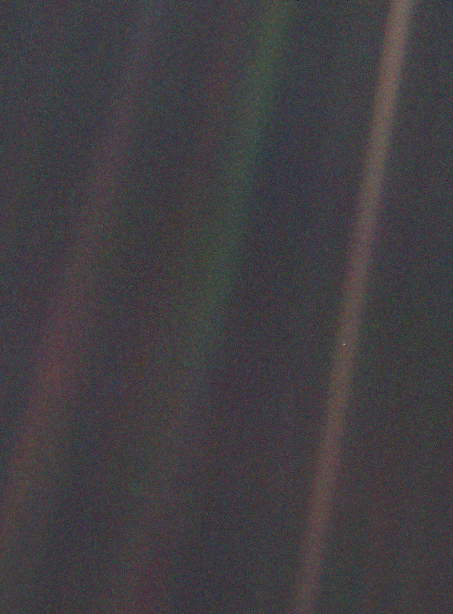 That pale blue dot serves as a reminder of our infinite smallness, the fragility of our home, the futility of our struggles on it, and the remarkable idea that we are anything at all.